In my earlier post estimating the range of the reported North Korean Musudan missile, I noted that my estimates were based on the assumption that the Soviet R-27/SSN-6, which the Musudan is reportedly derived from, has a range of 3,000 km with a 650 kg payload. That assumption is so important that I decided to dig into the origin of the 3,000 km range estimate. Tracing it back through several sources, I found that the origin of this number was text in a figure from the 1987 edition of Soviet Military Power (p. 33). SMP was produced annually by the Pentagon under the Reagan administration. Given the lack of concrete, detailed information about Soviet strategic systems and the political climate at the time, information like this is best viewed with skepticism. Moreover, my modeling also calls this range into question. The dimensions and mass of the SNN-6 missile and payload are known from the data exchange under START I. With those numbers, achieving a range of 3,000 km requires either a very high value of the specific impulse or a very high value of the fuel fraction—the percentage of the mass of the booster that is fuel. Using realistic values for both of these parameters gives a range of about 2,400 km with a 650 kg payload, which is the range for the SSN-6 based on Russian sources that is quoted in Pavel Podvig’s book Russian Strategic Nuclear Forces. North Korea is also developing an intermediate-range ballistic missile, approximately 3,200 km range. A description of O’Reilly’s comments states that he was referring to a missile with the same dimensions as the Musudan. 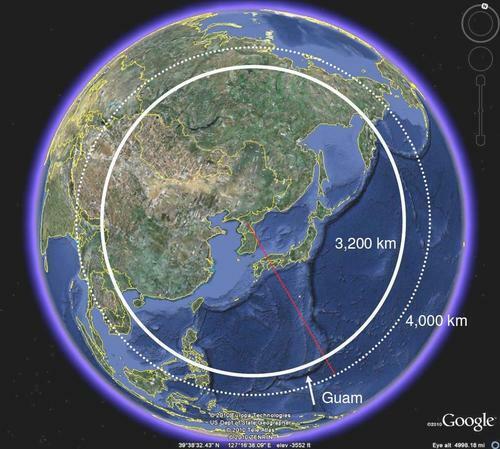 A range of 3,000 – 3,200 km means the Musudan would fall just short of Guam, which is about 3,500 km from North Korea. It seems unlikely that North Korea has a nuclear warhead with a mass of 500 kg or less, which would be required to increase the range to 3,500 km. My previous range estimates assumed a sea-level specific impulse for the SSN-6 of 280 sec. While the theoretical specific impulse for this combination of fuel and oxidizer (UDMH and NTO) could be in the high 280s, in practice a value closer to 270 sec is more reasonable, especially if the missile uses jet vanes for guidance, which stick into the exhaust and reduce the thrust. The results above assume a specific impulse of 270 sec.